High quality, good looking modern stools. The only thing I would mention is that, being white, the leather does start to look dirty over time even with regular cleaning. This isn’t a defect of the product, but simply an issue that comes with the territory. Contoured for comfort, the adjustable Andrina barstool by Safavieh marries form with function. with its sleek Italian-inspired lines, this contemporary barstool is crafted of stainless steel and upholstered in white PU fabric. 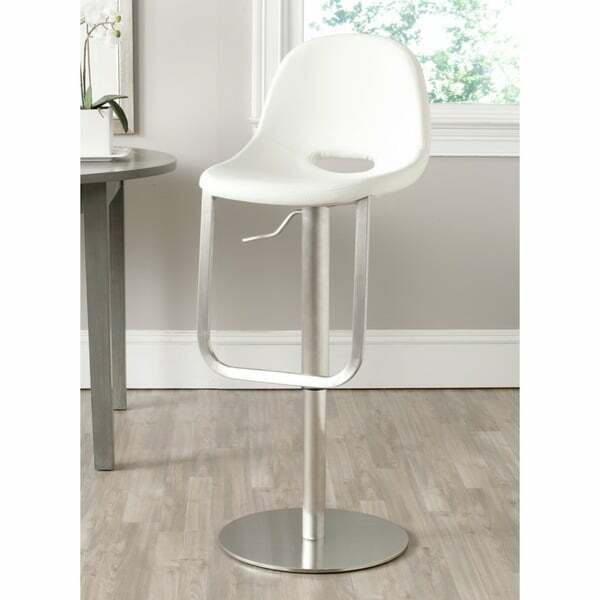 The Andrina barstool can be positioned from 33.46 to 42.91 inches in total height. Dimensions 33.46 - 42.91 in. H. x 19.69 in. W. x 16.54 in D.
"Is the base brushed nickel?" Hello sj, yes this does swivel. Have a great day!